The last time I visited my parents, I did a lot of work outside. But before I could mow, trim, dig, rake, and haul, I needed to remove about 30 orange and yellow flags from the yard. The city had cross-crossed my parents lawn with small flags identifying various cable and utility lines in preparation for some work that had been completed a couple of months earlier. And as I knew he’d never miss one flag, I packed one into my suitcase to share this idea with you. Let’s turn our attention to your gala. Remember that your silent auction is your store. Just as commercial retailers go to great lengths to bring attention to specific items they want you to buy, you should make an effort to bring attention to specific benefit auction items you want your guests to buy. Flags are one way to do that. The flags don’t need to be construction flags, though those might tie nicely into your theme. 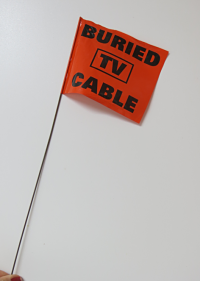 Construction flags are relatively easy to locate or inexpensive to buy online. During a teleconference last week, I listened as a school auction chair explained their silent auction layout and closing. Their auction theme is “Construction Junction,” which is a cute nod to some upcoming renovation work (really, a demolition project) their school will undergo next year. 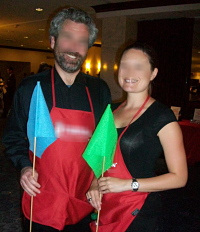 When our conversation turned to marketing, I thought of my Dad’s utility flags. Flags can also be used in the live auction. One of my clients runs a large auction with 1,200 guests. Although I bring my own floor crew to identify bidders, she always has a bevy of volunteers eager to help. 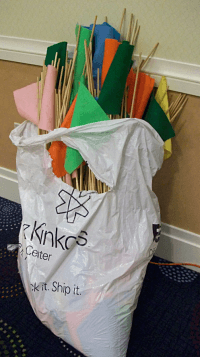 She gives each volunteer a flag to wave when they have a bidder in their section of the ballroom. It helps those of us onstage spot the bidders. 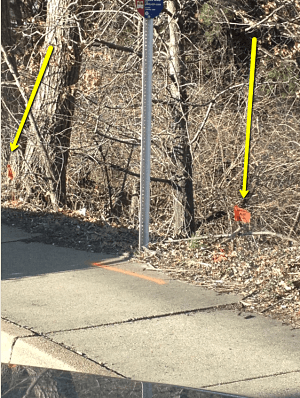 Here’s a tip: Opt for fluorescent yellow and orange-colored flags. Blue, red, green and other colors aren’t nearly as effective in a large ballroom. So have you ever used flags? How did it go? At a recent Artist Trust event to support the Art community, they used actual artists, called up on stage to signify each Thousand dollar bid received for their ‘Fund a Program’ auction. As volunteers for the evening, they were asked to wear funky red white and black, so together they made a quite wonderful living, cheering graphic. That’s a very visual reminder of money being donated, isn’t it, Doe? In D.C., the WWII Memorial has a wall of over 4,000 stars. Each star represents 100 Americans who died during the war. When you think about that looking at the stars, it’s like, “Whoa…..” And — of course on a MUCH more pleasant note — those artists onstage representing those $1000 donations visually creates a scale people can process. I like it! What a great idea! I’m already thinking of ways to use the flags at our upcoming auction!! Thanks Sherry. Sure. Send a photo, Lynn! For our live auction, we have about 320 guests (capacity) in the community centre, including a ‘back room’ that’s not entirely visible from the stage. Throughout the crowd are several volunteers with homemade flags (fluorescent orange triangles on sticks) – when a bidder makes their ‘move’, the volunteer yells and raises their flag, so the auctioneer and their stage assistants know there’s a new bid, and roughly where their bidder is seated – there is a lot of movement in the room, and it would be easy to miss someone raising their hand or bid card. There is also a flag volunteer in the silent auction area, in case someone working or bidding there wants to bid on a live item as well. Without those volunteers working the floor, we’d lose a lot of bids. Sounds like you’ve made those flags work for you, Mel! Thanks for sharing. What a fantastic yet simple idea. It has really given me food for thought. The same principle could be used i.e. Golf hole flags, Sports Club flags etc.